Giuseppe Severini is a musician and luthier dedicated to the study and reconstruction of stringed instruments and vocal repertories of XI and XII centuries. He directs the Secoli Bui society and the Casa della Musica e della Liuteria (House of Music and Lutherie) in Randazzo, Sicily, a private museum open to visitors. He is affiliated with Apemutam (France), and the Istituto di Archeoastronomia Siciliana. 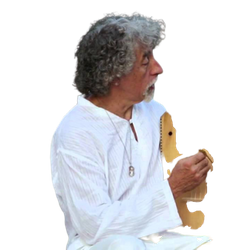 He has participated in medieval music festivals in Paris, Chartres, Le Havre, Largentière, Grasse, Santiago de Compostela, Moissac, Montpellier, Perugia, Bevagna, and Palermo.